OH NO…it’s the LAST DAY for Create with Connie and Mary Spring Collection 2015! That means first…we have FABULOUS project for you (check out the Create with Connie and Mary site to find out who!) AND it’s the LAST DAY to save $5 with the Early Bird special! What are you waiting for! Lost Lagoon – 5 1/2 x 4 1/4, run through the Spring Flowers Embossing Folder and add to card front. Very Vanilla – 4 5/8 x 3 3/8, layer onto Basic Black 4 3/4 x 3 1/2. Add panel to card front using dimensionals. Cut out largest butterfly from Crumb Cake, sponge edges with Baked Brown Sugar, add to card front. Put two strips of the black chevron Washi Tape (Stacked with Love) on 7/8 x 2 3/4 Very Vanilla, trim into banner. Stamp thank you in Memento Black on Very Vanilla, punch with 1 1/4 Circle Punch, later on 1 3/8 Lost Lagoon Punch the Soft Suede Label Bracket punch. Add to card front. Add Basic Rhinestones to butterfly and ribbon to finish off. This is it…the last day of Preview Week for Create with Connie and Mary Spring Collection 2015 design team! And we LOVE Preview Week because it gives you a chance to see what we are all about. The session runs from January 18th through February 14th. 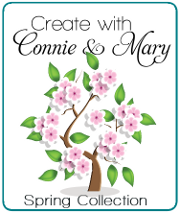 During Preview Week we are offering our Early Bird Special…subscribe to Create with Connie and Mary Spring Collection 2015 for ONLY $24.95! This entry was posted in Create with Connie and Mary, Spring Mini and tagged Painted Petals. Bookmark the permalink.